The wind has come up very fiercely in Whyalla. But it dropped the temps by about 15 degrees in what felt like a handful of minutes. 43.6 to 32.1 in 20 mins, definatly significant. NE through the iron triangle. had similar to here but not as pronounced. to average 60 gust 75 kmh. Woken by a lot of storm activity going straight over Whyalla. I doubt anyone is asleep in this little city just now. Little bit of rain here this morning. nice tabletop with a bowl of fruit out east this arvo. not bad structure for no strikes. Would be nice if we had a working radar. Pretty well the only service that BoM provides that I use and they manage to screw even that up. Getting pretty tired of dodgy radar coverage/holes through the middle of cells/entire frames missing at random intervals. Seems to happen with greater frequency during storm/rain events as well. Complete joke. Ever since that last 'upgrade' there's been nothing but problems. Yeah, was surprised to see dropped frames that being totally clear frames whereas the previous frame had obvious rain events. Also frames in which the central area dropped out. What's going on? almost been worth chasing if i wasn't so demotivated. Radar keeps switching between short and long pulse atm, I'd say it probably needs a part shipped and at this time of the year, that's gunna take time. Yeah TH talk about motivation. Had these storms been 60km south, would have cleaned up here. Jamestown to Spalding way had over a dozen individual high quality high based cells the last two nights. Saw some decent and very unusual stuff from Clare the other night as well, but pulling all nighters with hours of darkness between cells isn't exactly fun. Mid North has had a very respectable season this spring/summer. Given last nights efforts, from a chasing perspective has been very nearly as good as 2016. 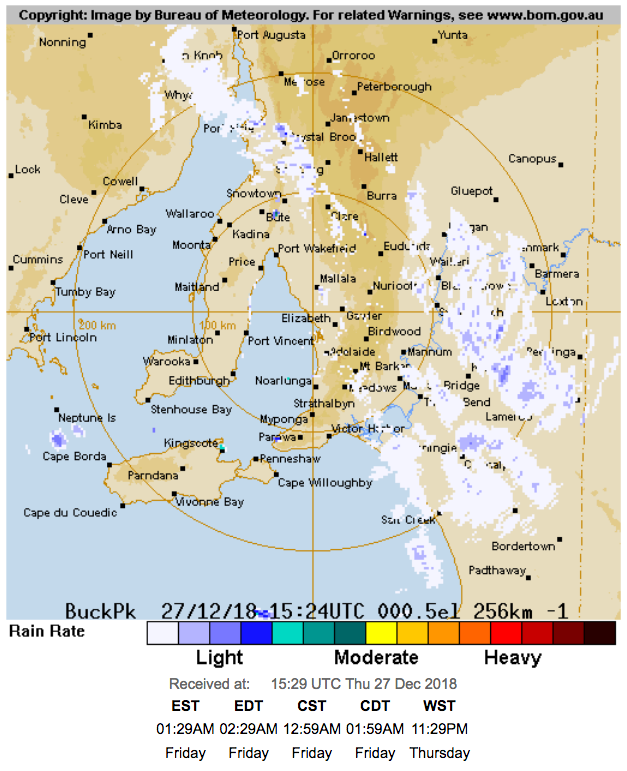 The mid north has this awful habit of peaking for high based storms at stupidly early hours though making getting them an extremely exhaustive process. over the years on some big 24hr chases from SESA to Central Vic. a good one its a while before you want another. back then my enthusiasm was radiant and unwavering. the throat and there's nothing i can do to make it let go. interjected by the odd clandestine scorcher. dancing to later this summer. Look I've some serious stuff to do...you've and everyone one else have to help. This is not funny any more . next weekend but at this stage no guarantees. park is still lirking around. Whats with the drop in temperature between 11:00am and midday today? Generated in 0.516 seconds in which 0.492 seconds were spent on a total of 14 queries. Zlib compression disabled.